Episode 120: ICON 2017 Series - State of SA Esports! We round out our third season with one more panel from ICON 2017 and we're continuing with the esports theme. Last year, ICON 2016 played host to a panel discussing the state of esports in South Africa, and it was a very busy year for esports since then. Last month saw the completion of TWO major esports events in South Africa (the Rush event brought to you by NAG, and the VS Gaming event), last weekend saw the inaugural Valkyrie Girl Gamer competition with 50 thousand rand prize money as well as the announcement that the Nexus in Randburg, Johannesburg will play host to the Hearthstone European Summer qualifiers for South Africa. The profile of esports has never been higher. And all of this can be framed against the backdrop of Valve's DOTA 2 The International, which has amassed an incredible prize pool of over 24 million US dollars. With the massive growth of esports locally, we'd like to present to you this year's ICON 2017 panel talking about the state of esports in South Africa, hosted by SA's Tech Girl, Sam Wright. Esports continues to surge in popularity all over the globe, and South Africa is no exception, but without a doubt it’s still very much seen as a male-dominated space. This makes it difficult for females to find a way into gaming without feeling intimidated by their male counterparts. Steps are being taken, however, to get more women involved, and to identify up and coming female esports talent. 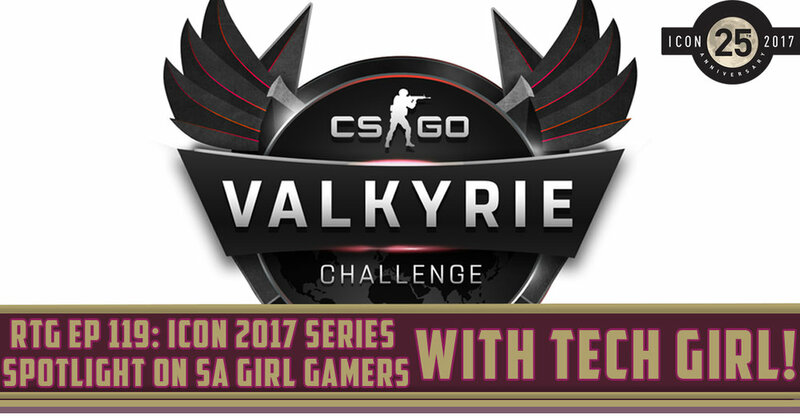 This weekend, SA's Tech Girl, Sam Wright, in partnership with Mettlestate and Evetech, is launching the "Valkyrie Challenge" - two all-girl CS:GO teams (Amaryllis Gaming and Energy Esports) battling it out in a winner take all R50,000 best-of-five matchup. To give you some background as to the importance of these sorts of events, we're proud to present another ICON 2017 panel recording. At ICON in June, Sam Wright took to the main stage to discuss the state of gaming from a female perspective in South Africa, and talked about the local girl gamers who are on the verge of big things, as well as the recent, and future initiatives to help girl gamers make the mark. 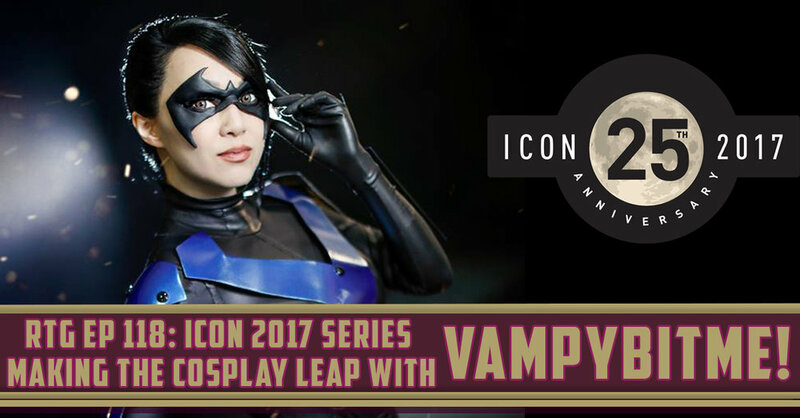 Episode 118: ICON 2017 Series - Making the Cosplay Leap with VampyBitMe! The world of cosplay has grown in leaps and bounds over the last decade, with the scene expected to be worth over R20 billion dollars by the year 2020. How, you might ask? There are a number of factors, ranging from the sheer cost that goes into buying the materials that make a costume, appearance fees by top cosplayers to appear at events and conventions around the world and fees charged by cosplayers to help companies promote their brands. As the cosplay economy matures, there will be plenty of cosplayers looking to take the next step and become semi-pro or full-time professionals in this new market. Linda was generous enough to share with our audience at ICON 2017 her tips on what cosplayers should do in order to make this leap to becoming a cosplay professional. You can follow VampyBitMe on Facebook, and on the Twitter Machine! And so we begin with our ICON 2017 panel series! In June this year, ICON celebrated its 25th anniversary and ran over 40 informative panels on various pop culture topics. Today, we present to you the panel discussion held by Warren Roberston and Owen Swart on the topic of making money through the speculative trading market around Magic: The Gathering cards. M:TG cards can fetch thousands of dollars, however their valuations can fluctuate wildly based on the trends taking place in the game. Warren and Owen discuss the best options when it comes to getting in to the speculative game, and where you SHOULDN'T be spending your money.